As the Assistant Registrar for Cranbrook Educational Community, it is my job to keep track of the objects in the collections of the Art Museum and the Cultural Properties across the campus. Though not trained as a Museum Registrar, George Booth had a similar goal: he fastidiously kept his many collections and cultural properties around his home and the various school buildings inventoried or appraised. The inventory, “Cranbrook Museum Art collection: 400 thru,” led me to a wonderful collection of coins and medals. Some were ancient, some were more contemporary, but one in particular stood out: a memorial medal for soldiers who died during the First World War. What was the story behind this medal? Since none of the Booth children died during the war, I wondered why George Booth would have one of these medals in his collection. During World War I, many prominent Americans spoke out against the war in Europe, including Henry Ford and Reverend Samuel Marquis (who in 1927 became the first rector of Christ Church Cranbrook). As the editor of The Detroit News, George Booth oversaw “the leading newspaper in the country to give open and courageous expression to criticism.” The News editorial staff had “sincerity of purpose and courage to voice temporarily unpopular principles.” The United States entered the war in 1917 but The Detroit News continued its criticism. That criticism, however, was focused on governments and policies, not at the soldiers who put their lives on the line. Indeed, Booth was very supportive of the fighting men who went off to war and of the families of those who did not return. He, architect Albert Kahn, and Clyde Burroughs (Director of the Detroit Museum of Art) established the Welcome Home Committee of Detroit – similar committees were formed in other major U.S. cities. The committee made sure all soldiers who returned from the front received the thanks of the nation and distributed rings and certificates of service to them upon their return. The Committee’s recognition did not end with the men who returned. It also distributed the memorial medal to the families of the war dead from Detroit. This medal, designed by sculptor Paul Manship and forged by Medallic Art Company in New York, was given as “a token of sympathy and gratitude to the nearest kin of those who gave their lives in the country’s service” during the Great War. Detroit Soldiers Memorial Medal, 1919 (obverse). Image Courtesy of Cranbrook Art Museum. The front of the medal bears a winged female figure representing Victory striding forward while holding a sword wrapped in a palm leaf (sword of war and palm of peace) with a radiant sun in the background. The text around Victory reads, “VIXIT VIVIT VIVET” [lived, lives, will live]. Detroit Soldiers Memorial Medal, 1919 (reverse). Image Courtesy of Cranbrook Art Museum. The back of the medal reads, “Presented by the City of Detroit 1919.” At center is a scroll inscribed, “In Memory Of One Who Died in the Cause of Freedom and Humanity.” Above, an eagle holding a laurel wreath is perched atop the end of a cannon and ball. The Burton Historical Collection at the Detroit Public Library has a great image of a large crowd at Campus Martius for a memorial service to honor WWI soldiers. I suspect that one of the men on the dais is George G. Booth, there to honor the Detroit war dead and their families. For more on George Booth and his opinions on the war in Europe, see the George Gough Booth Papers and for more on Manship’s work at Cranbrook, check out Cranbrook Archives Digital Collections and Cranbrook Art Museum. Lydia Malbin in her Manhattan apartment, 1984. Courtesy Cranbrook Archives. But what she was best known for was her vast collection of modern art, an interest that began for her in the 1930s and continued throughout her lifetime. This week I received a query from an art auction house in London, England. They have a work by German-American painter, Lyonel Feininger, that had once been in Malbin’s collection and was on display in a 1951 exhibition at Cranbrook Art Museum called “The Collection of Mr. and Mrs. Harry Lewis Winston.” (Winston was Lydia Kahn’s first husband.) As auction houses often do, they wanted to verify that Feininger’s painting “Becalmed” had indeed been in this exhibition. As I researched this work, it reminded me of Malbin’s additional connections to Cranbrook. Exhibition Catalog, 1951. Courtesy Cranbrook Archives. Not only was Malbin a student at the Academy of Art, she was also one of the six Cranbrook-related artists who contributed to the Saarinen-Swanson Group, an affordable, coordinated line of modern home furnishings, which debuted in 1947. Malbin designed the oven-ware pottery, manufactured by Frankoma Pottery Company, and china with glazes meant to “simulate the quality and color of semi-precious stones” manufactured by Glenco Porcelain Company. She also designed ash trays and vases – a line of “red ware” – which featured clay and glazes from Ferro Enamel in Cleveland, Ohio. Detroit Free Press, September 1948. Courtesy Cranbrook Archives. Malbin began collecting modern art in the 1930s. Though her father, Albert Kahn, couldn’t stand modern art, he did instill in all of his children the lesson that they should be independent thinkers. So, Malbin sought out what SHE liked – “tough, off-beat things” rather than popular artists or “pretty pictures.” She and her first husband, Harry Winston, were an art collecting team until Harry’s death in 1965, and Malbin’s second husband, Barnett Malbin, while not a collector himself, supported her collecting activities and even made photographic records of her art for her archives. For more on Malbin’s collecting interests, check out the Lydia Winston Malbin Papers at Yale’s Beinecke Rare Book and Manuscript Library and the Barnett and Lydia Winston Malbin Papers, 1940-1973 at the Archives of American Art. Henry Scripps Booth, photographer. Pleasures of Life, Vol. IV. Courtesy Cranbrook Archives. In this 1919 photo taken by Henry Scripps Booth of his two friends and architecture classmates Fred Morse and Martin Lexen, they’re all hanging out (and almost off of!) the roof of the University of Michigan’s brand new General Library by architect Albert Kahn. I found this snapshot in volume four of Booth’s Pleasures of Life series, which has lots of great images of the Booths at Cranbrook and of his friends at the university (where Henry studied from 1918- 1924). The building they’re sitting on here, known as the Harlan Hatcher Graduate Library since 1971, figures prominently in the Center for Collections and Research’s next Day Away trip on October 28! Dedication of the new (Hatcher) library building, 1920. Henry Scripps Booth’s Scrapbook Album, Courtesy Cranbrook Archives. While we won’t be quite so daring as to dangle our feet off the roof, you are invited to join the Center as we explore Albert Kahn’s architecture at University of Michigan. Best known for his industrial architecture in and around Detroit (and of course Cranbrook House), this tour will introduce you to his academic buildings. The day includes morning lectures followed by in-depth tours of five Kahn structures (including rarely accessible spaces like the carillon in Burton Memorial Tower), all interspersed with narrated walks and drives. I should mention, though, that the Day Away won’t just be about touring. We’ll stop for a delicious lunch at Taste Kitchen, an acclaimed new restaurant by owner and chef Danny Van. It came highly recommended by friends of the Center, and we’re very happy Van has designed a three course meal, with optional drink pairings, just for us. In this photo, we see Booth’s friend Fred’s “long, lankey and lean” body around a street sign—with assistance from the bottom-half of another Cranbrook luminary and friend of Henry, J. Robert F. Swanson. * The photo shows the two goofing around on a road outside of Ann Arbor. For this post’s purposes, I’ll imagine they’re on the very route we’ll be taking from Cranbrook to Ann Arbor on October 28! There shouldn’t be any dangerous curves on our trip, though it’s guaranteed to be informative, delicious, and fun. Call and get your tickets today! *Did you know Booth and Swanson met studying architecture at U of M, where they also encountered a certain visiting professor, Eliel Saarinen? In November 1932, Cranbrook Academy of Art’s Executive Secretary, Richard Raseman, invited architects from the Detroit area to come to Cranbrook for “dinner and discussion of things Architectural.” The following Cranbrook School news article describes the evening. In addition to Raseman, Eliel Saarinen, Albert Kahn, and Emil Lorch, attendees included former Kahn associate Ernest Wilby and Ralph Hammett. I came across Hugh Ferriss’s book The Metropolis of Tomorrow while assisting Judy Dyki, Director of the Cranbrook Academy of Art Library, in curating an exhibit of some of our rare and special collection books for the Bloomfield Township Public Library. Ferriss (1889-1962) was a degreed architect, but he was most sought after for his architectural renderings of buildings. He developed an idiosyncratic style, often depicting buildings at night, seemingly enveloped in a kind of mist, with streetlights and the rays of the moon serving as illumination. I find Ferriss’s work intriguing because his drawings were so different from the typical architectural renderings of the 1920s to 1950s. The gothic yet futurist sensibility displayed in his work has influenced contemporary filmmakers like Tim Burton and Christopher Nolan. Ferriss has several connections to Cranbrook, the first being the drawing of the Detroit News Building that is in the collection of the Cranbrook Art Museum. 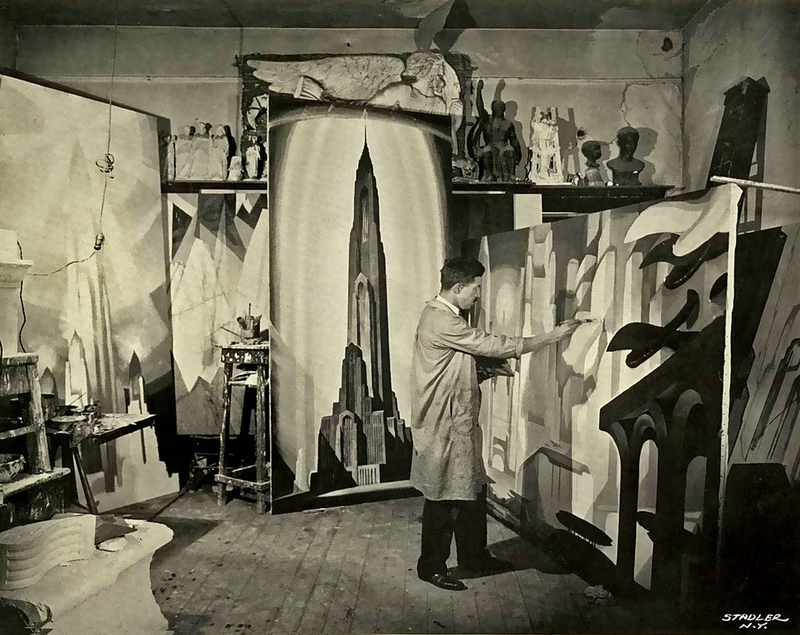 Hugh Ferriss in his studio, ca 1925. Photo by Stadler, New York. Courtesy Creative Commons. 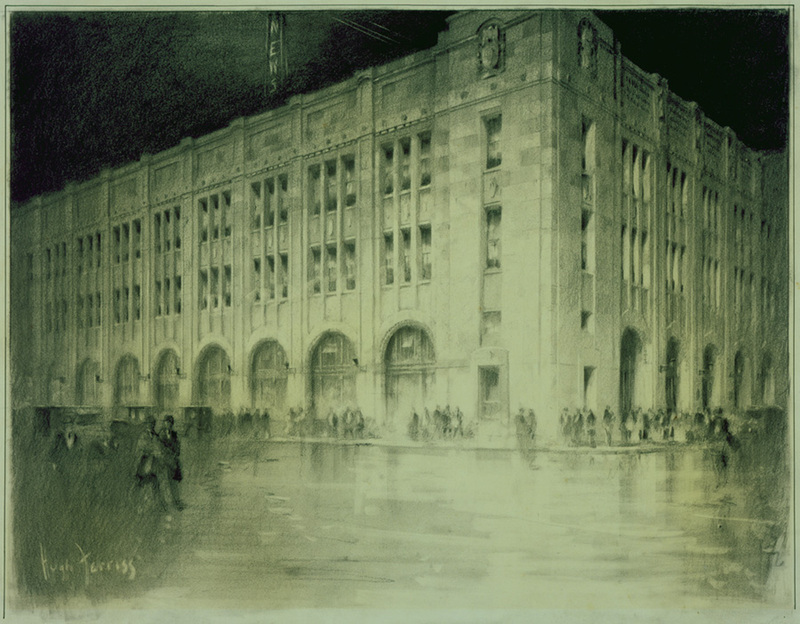 The history of the Detroit News Building drawing is an interesting one. The J.L. Hudson Company, in honor of the company’s 46th anniversary and the opening of the new Detroit Institute of Arts building in 1927, commissioned Hugh Ferriss to create a series of architectural renderings of Detroit buildings, both extant and proposed, that contributed to Detroit’s rapidly changing skyline. Twenty-two of these drawings where exhibited in the windows of Hudson’s downtown store in August 1927. Among these were two renderings of Eliel Saarinen’s proposed plan for a new Detroit Civic Center complex. Also included was this drawing of the Detroit News Building. The Detroit News building, which opened in 1917, was commissioned by George Gough Booth, and designed by architect Albert Kahn. Booth, president of the Detroit News (and Cranbrook’s founder) purchased the drawing of the Detroit News Building directly from J.L. Hudson’s in October 1927 for the Academy of Art collections. (Accessions Book No. 1, Cranbrook Academy of Art). To coinicide with the exhibition, J.L. Hudson Co. published a commemorative booklet entitled For a Greater Detroit, which contained Ferriss’s drawings and included editorials by various community leaders that discussed Detroit’s future. A copy of this booklet can be found in the Edsel Ford Office Papers at the Benson Ford Research Center. Ferriss’s drawing was transferred from the Academy of Art to the Art Museum in 1955, and is considered one of the museum’s “One Hundred Treasures”. Editor’s note: For additional information about the work of Hugh Ferriss, check out the Avery Architectural and Fine Arts Library at Columbia University. 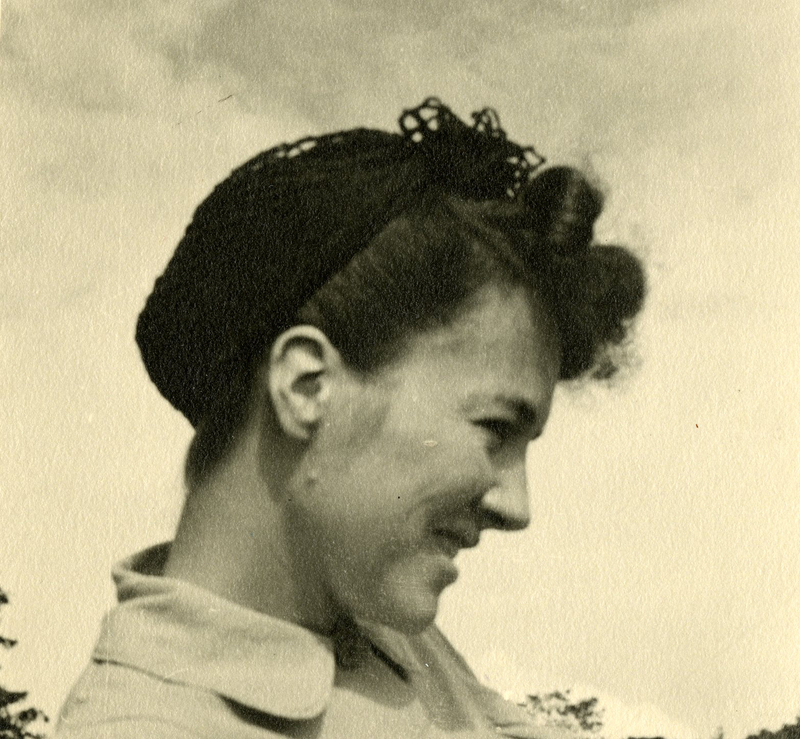 Anne Morrow Lindbergh, 1943. Cranbrook Archives. Anne Morrow Lindbergh picnicking at the Greek Theatre at Cranbrook, Jun 1944. Copyright The Detroit News. In August 1943, Kathleen Belknap decided to sell the home, then known as Belwood, and the Lindberghs moved into a home at 411 Goodhue Road, behind Christ Church Cranbrook, for the next year. The two years spent at Cranbrook forever changed Anne spiritually. She discovered self-confidence, and that people liked her for who she was. 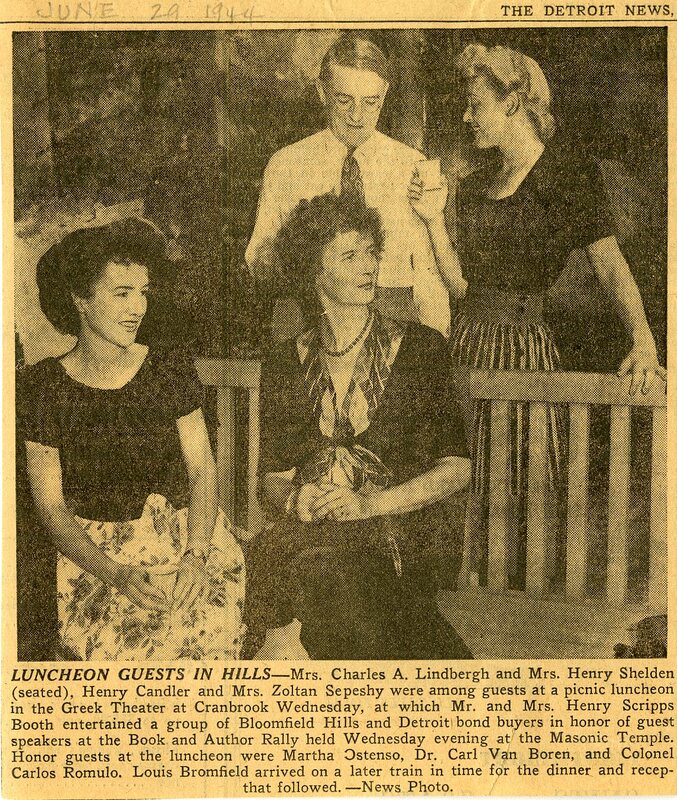 After the Lindberghs returned to the east coast in 1944, Anne missed her Cranbrook friends and the life she had discovered here and wrote that she felt “only half alive since I left Cranbrook.” The Lindbergh family continued to return to the Detroit area to visit Charles’ mother Evangeline at her Grosse Pointe residence until she passed away in 1954. In January 1974, at the request of the Class of 1974, Kingswood School headmaster Wilfred Hemmer invited Anne to be the school’s forty-fourth commencement speaker. 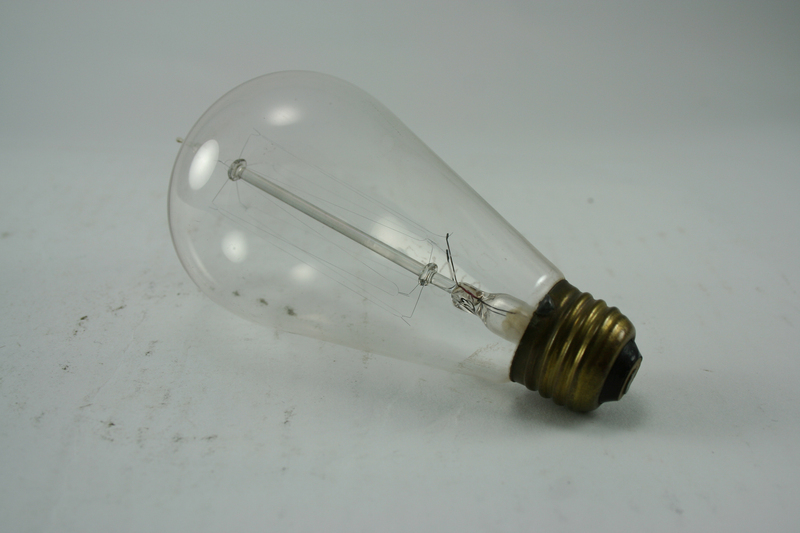 Glass-etched Edison bulb from 1920, Cranbrook Cultural Properties Collection.. While browsing the historical writings of Henry Scripps Booth recently, I came upon the answer to a question that Collections Fellow, Stefanie Dlugosz, had posed late last year. 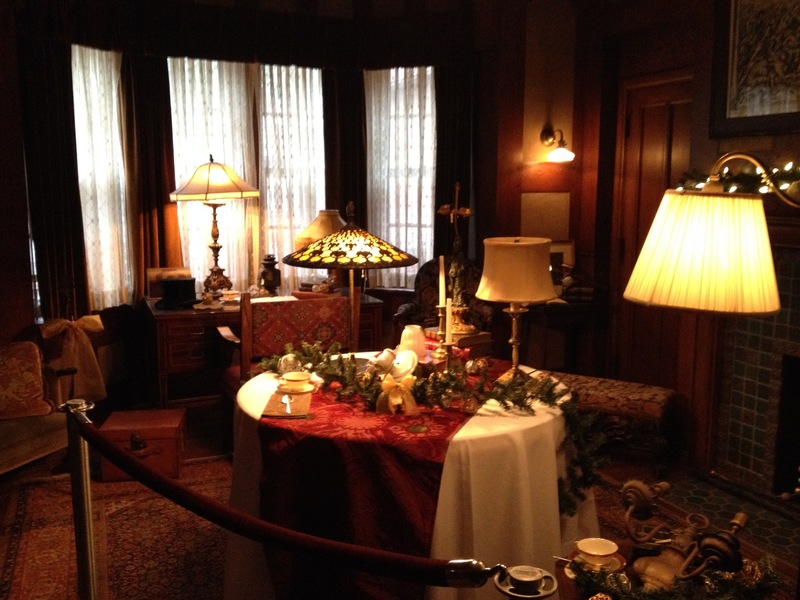 As she prepared the Center for Collections and Research’s Holiday Tables exhibit (“Illuminate the Seasons” was the theme), which highlighted the early use of electricity in Cranbrook House, Stefanie had wondered what the source of electricity was, in 1908, for a relatively isolated place like Cranbrook. Efforts by several people could not turn up an answer. Until now. 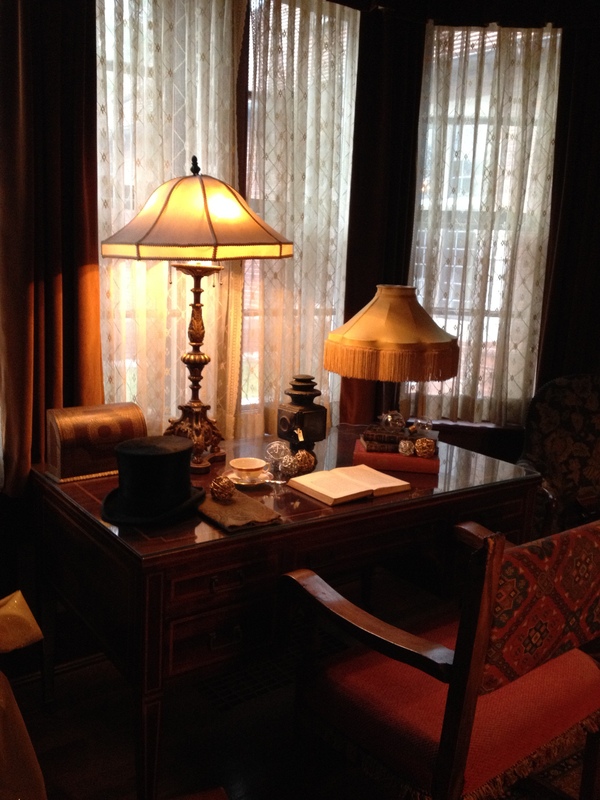 “Although Caldwell’s electric fixtures had been installed about December 1, we still had to use candles and oil lamps for light because the private Edison line being installed from Highland Park to Cranbrook House was incomplete.” This was recorded during the 1980’s in Henry’s unpublished History (which relates the history of Cranbrook Educational Community and the Booth family between 1800 and 1987). 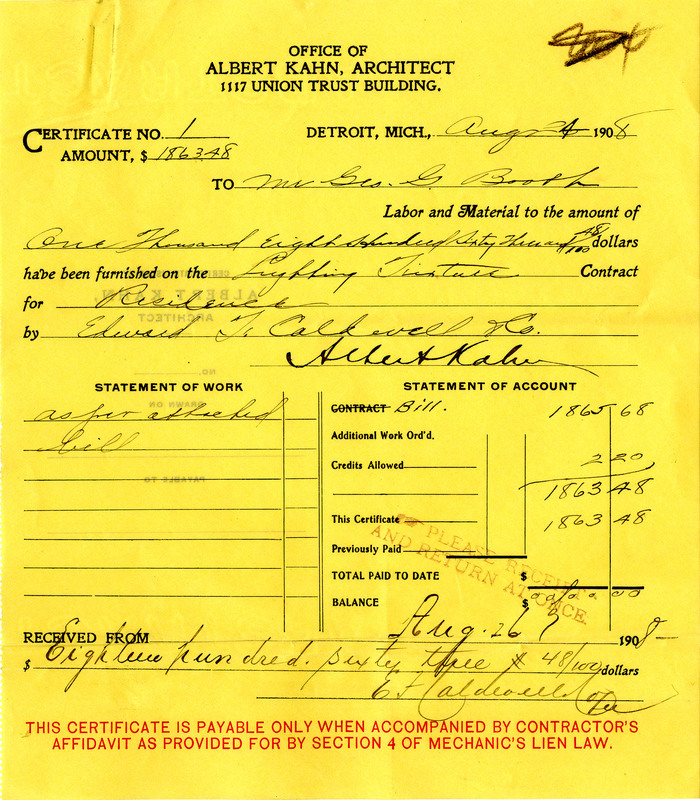 As the bill from Albert Kahn shows, George G. Booth spent $1863.48, around $49,000 in today’s dollars, on lighting fixtures in Cranbrook House. The order is itemized, room by room, on seven pages of legal-sized paper, in Booth’s papers. George Gough Booth Papers, courtesy Cranbrook Archives. Read the original blog for more information on the Caldwell lighting fixtures at Cranbrook House. 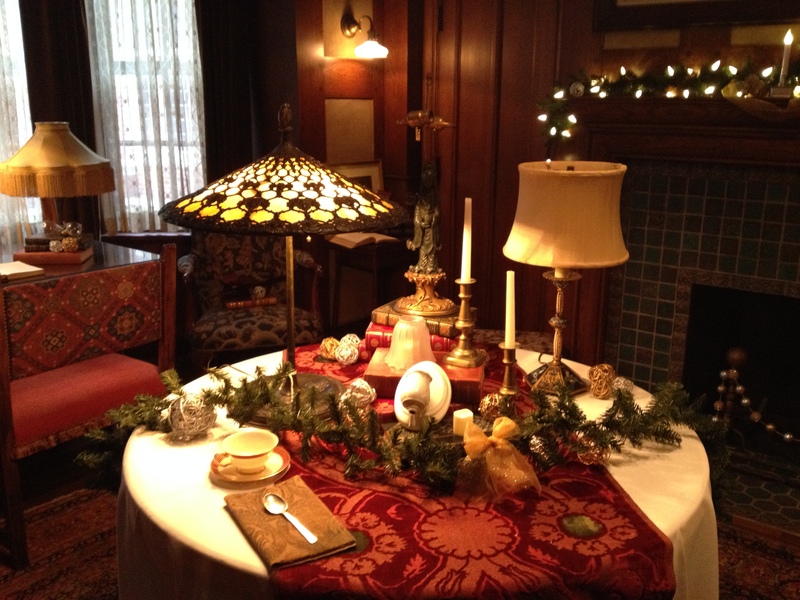 Lighting Up Cranbrook House: Edward F. Caldwell & Co.
Holiday Tables, 2014. Stefanie Dlugosz, photographer. This past weekend the Center for Collections and Research put on a display for Holiday Tables at Cranbrook House, organized by the Cranbrook House and Gardens Auxiliary. Associate Registrar Gretchen Sawatzki and I put together a display highlighting the electric lighting original to the home, focused on lamps and lighting by the Edward F. Caldwell & Company. Cranbrook House was designed and built in 1908, and George Gough Booth always had the intention of having electric lighting throughout the home. Within the city of Detroit there had been an interest in electricity, and by 1906 there were two power plants on the Detroit River owned and operated by the Detroit Edison Company. However, with Cranbrook House being roughly 20 miles to downtown Detroit, this was an achievement. The Booth’s interest in innovation propelled them to always be ahead of their time by investing in the newly available widespread utility for their home. In the first half of the twentieth century Edward F. Caldwell & Company was America’s premier design and manufacturer for electric light fixtures. The New York firm founded in 1895 created designed and works with several prominent clients at the time including the Frick, Morgan, and Carnegie families. Much of their work was done in tandem with architectural commissions, and therefore clients like Booth were able to provide input and alter details to customize their lighting choices. Booth provided his own ideas about a few pieces for the home, but overall selected most of the pieces directly from their catalogues. During the construction and design of Cranbrook House, George G. Booth was actively involved in conversations with Albert Kahn, the architect, and many of the vendors providing goods and products for the home. Booth was enthusiastically involved in providing input on the design elements of the home, and the lighting was no different. Many of the Edward F. Caldwell & Co. catalogues can be found online through the Cooper-Hewitt Museum Library, Smithsonian Institution Libraries. Happy Belated Birthday to Our Founder! September 24th marked the 150th birthday of Cranbrook’s founder, George Gough Booth. Born in Toronto, Mr. Booth had an early interest in art and architecture. In 1881 his family moved to Detroit and he put his artistic talents to work by purchasing half of an interest in an ornamental ironworks firm. The business was successful and used many of Booth’s product designs. In 1887 Booth married Ellen Warren Scripps, daughter of Detroit News founder James Scripps. The following year he sold his share in the ironworks business and joined the News staff as its business manager. The News blossomed under Booth’s direction, becoming one of the leading metropolitan dailies in the nation. 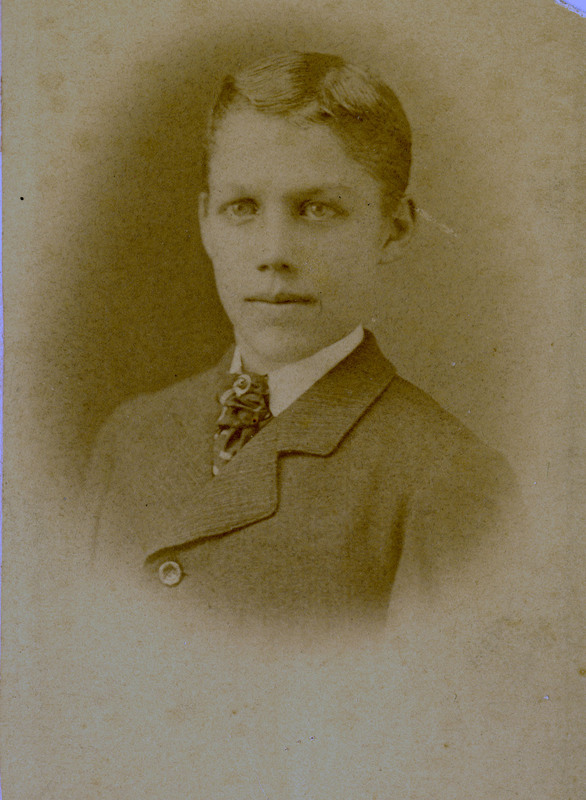 In 1906, Booth became president of the newspaper, succeeding his father-in-law. In 1904 George and Ellen Booth purchased a run-down 174 acre farm in Bloomfield Hills and named it Cranbrook after Booth’s ancestral town in England. Booth called upon his long-time friend, and noted Detroit architect, Albert Kahn, to prepare working drawings for the building of Cranbrook House. Kahn responded with an English Arts and Crafts inspired design the Booths moved into their new home in 1908. In 1922, believing their country estate could serve a larger public purpose, the Booths shifted their focus toward building the six institutions at Cranbrook: Brookside School, Christ Church Cranbrook, Cranbrook School (for boys), Cranbrook Academy of Art, Cranbrook Institute of Science, and Kingswood School (for girls). George Booth was a visionary, and with his wife Ellen, set new standards for generosity, leaving us a legacy we are proud to be a part of. Happy belated birthday George!